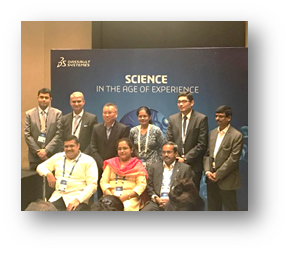 The first local edition of the global megatrend event Science in the Age of Experience was successfully launched in Bengaluru on 11th October 2018, with participation from over 400 customers from the scientific, engineering, and technological community across different industries. Built upon the four pillars of “Science is Personal”, “Science in Discovery”, “Science is Sustaining”, and “Science is Material”, the event featured a host of distinguished speakers in the plenary session, as well as numerous customer presentations in the parallel tracks. In the opening remarks, Renuka Srinivasan, Director, SIMULIA WW Services, Dassault Systèmes remarked upon the importance of science in any innovation process, and how the company has not only brought this message to the global stage but also enabled this effectively through the 3DEXPERIENCE platform. Suresh Kumar, Brand Leader, BIOVIA, Dassault Systèmes India and Bhavesh Kumar, Brand Leader, SIMULIA, Dassault Systèmes India shared the stage with her to talk about their respective brands and how these solutions are being used by customers in India. The highlight of the event was the keynote presentation by Dr. Venkatsubramaniam Ganesan, Professor of Psychiatry, NIMHANS, on “Personal Computerized Neuromodulation.” Dr. Ganesan took us through the challenges faced in the treatment of schizophrenia, a neurological disorder, and how science, with the help of advanced engineering simulation, helps gain valuable insights into how different patients respond to treatment. Based on the simulation results from SIMULIA solutions, Dr. Ganesan said that he was confident in tailoring a patient-specific treatment. Further, he emphasized the need for machine learning and cloud in establishing better insights given the historical data available. Sumanth Kumar, Vice President, SIMULIA Strategy & Marketing, Dassault Systèmes gave a glimpse of “Science at Dassault Systèmes” through technology acquisitions over the years, and how these are coming together with the 3DEXPERIENCE platform in addressing global trends such as additive manufacturing and personalized healthcare. Dr. Annamma Anil Odaneth, Associate Professor, Institute of Chemical Technology, talked about one of the key issues that concern us all: our environment. She provided an eye-opening overview of the extent of environmental damage and the need for innovative methods to control this. She also shared the work that her team is doing on BIOFUEL, especially with ethanol, in achieving this. Mr. Ravi Shankar, Managing Director, Accreate Additive Labs, touched upon the important topic of healthcare through his talk on, “Enriching Life through Science, Innovations by Design.” He specifically highlighted how the emerging trend of 3D Printing is poised to revolutionize healthcare, not only in providing better treatments but also in teaching the right skills to upcoming physicians. Cmdr. Balaji, Distinguished Scientist, and Chairman of Center of Excellence for Aerospace & Defence, Govt. of Karnataka, presented on “How Science could be Leveraged to Develop Workforce of the Future in India.” Using his diverse experience working on the Tejas program, Cmdr. Balaji highlighted the need for science and technology to be the basis of the future workforce. The plenary session concluded with an address to the audience by Samson Khaou, Managing Director, Dassault Systèmes India. In his closing remarks, he emphasized on the commitment that Dassault Systèmes India in developing, nurturing, and expanding the use of science towards driving innovation in healthcare, environment, research, and development, as well as education. The parallel tracks in the afternoon session of the event were spread across four industries: Transportation & Mobility, Aerospace & Defense, Industrial Equipment, and Life Science. While speakers from Dassault Systèmes presented on topics such as electric vehicles and simulation data science, the highlight definitely was the enthusiastic group of customers sharing their experience in using solutions from Dassault Systèmes. The tracks boasted presentations from Royal Enfield, Ashok Leyland, Airbus, ADA, Robert Bosch, L&T, Sun Pharma, IPCA, and many others. The 3DEXPERIENCE Playground provided our customers with an opportunity to try out the virtual reality setup for an immersive experience in visualizing simulation results, and also to learn more about the latest additions to the simulation portfolio by the SIMULIA brand. Further, customers also had a chance to interact with our valuable sponsors for the event: Lenovo, Beta CAE, and EDS. Overall, Science in the Age of Experience was an impressive debut with insightful presentations, impressive messages, and an enthusiastic audience.